I made this card for my Mother-In-Law for valentines day. We will be giving it to her tomorrow, so I hope she likes it. The stamp used is the main floral arrangement stamp from the Altenew Blooming Bouquet stamp set. The image was stamped with VersaMark and heat embossed using white embossing powder. I used the Zig Clean Color Real Brush Markers and a water brush to watercolor the image. The embossed image helps me keep the colors in the correct areas. I applied a small line of ink and then used the water brush to spread the color out. The “love” word was die cut 5 times and glued together to give it dimension; I only applied the stamped color to the top layer. I put the negative space from the die cut in my MISTI stamp positioner tool. I lined up the matching stamp in the negative space and lifted it up with the lid. Then I placed the die cut in the negative space and stamped it. 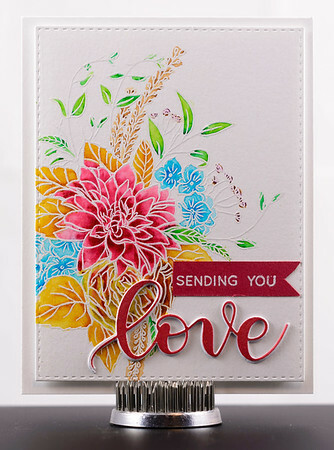 The “Sending You” sentiment was heat embossed with white powder on matching colored paper. The one end was notched to make it look like a banner. I mounted the completed image panel on a fun foam piece using Scor-Tape. Then I attached the foam backed panel to a Neenah Smooth Solar White 110 lb card base using Scor-Tape. Inside I stamped “Happy Valentines Day”.